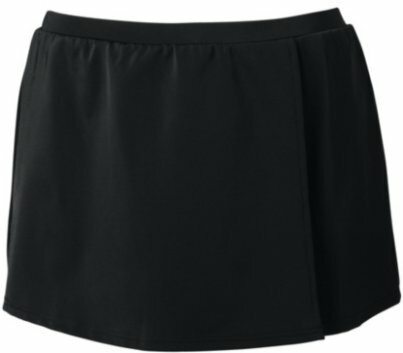 This swim skirt from ChristinaÂ® lets you select the perfect fit. A faux-wrap swim skirt that features signature Tummy Tamer slimming and an attached brief. Pair the skirt with any swim top for a fun and sporty combo that offers coverage and confidence, so you'll feel as good as you look. Nylon-spandex. Hand wash. Imported. Festival slide tri features removable soft cups, ruching and lettuce edging. Suits A - B cup. The Festival Mini Hipster will have you thinking you are in Rio all summer long. The classic mini hipster shape features keyhole tie back detail with lettuce edging. As well as looking cute and colourful, the roll-top design is versatile and can be worn up high as a pant or pulled down for a skirted look. The Seafolly 2013 Shimmer Starlette Bandeau Top twits in front, has removable a removable strap and padded cups. The Seafolly 2013 Shimmer Starlette Hipster Bottom has frill detail and offers moderate coverage. Fabric Content: 80% Nylon, 20% Elastane.